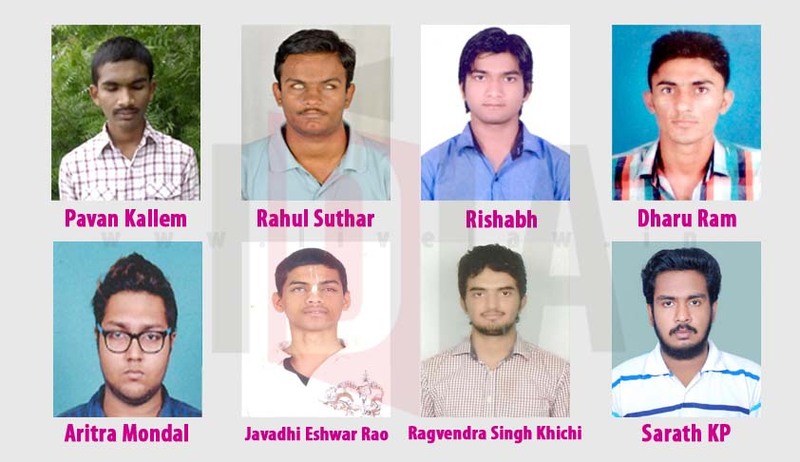 IDIA (Increasing Diversity by Increasing Access to Legal Education) continued its success this year as well, with eight of their scholars making it to the leading law schools in India through the first CLAT allotment list. More scholars are expected to make it, with other lists yet to be released. Pavan’s story is one of true grit and determination. Despite his visual impairment and poverty, Pavan’s inspirational efforts have secured him admission to NALSAR University of Law, Hyderabad, rated as amongst the top three NLUs in the country. Pavan admits to always being interested in legal affairs. Described as a focused and hardworking student by the IDIA volunteers who trained him over the last two years, Pavan hopes to indulge his deep interest in the law, and aims to make a difference to the society at large through this newfound knowledge. Pavan enjoys playing chess in his spare time. Rahul’s father is a factory worker and the only earning member of the household, earning hardly INR 85,000/- per year. Neither his visual impairment nor financial disadvantage prevented this inspiring young man from translating his dreams to success. He excelled in CLAT 2016, scoring 127 and ranking among the top-performing IDIA trainees across the country this year. This enabled him to secure admission into the West Bengal National University of Juridical Sciences, Kolkata, rated amongst the top 3 NLUs in the country today. In Rahul’s own words, he wants to pursue law to “ensure that speedy and affordable legal aid is made available to all, especially those hailing from lower economic strata.” He has an unquenchable thirst for knowledge, and likes reading in his spare time. Rishabh’s father is a tent decorator with an annual income of about INR 70,000/-. The difficulties he has faced due to the lack of financial resources have not dampened his cheerful optimism about his future. A bright scholar who had been trained by the IDIA Delhi Chapter, Rishabh finished school from a Government Senior Secondary School in Delhi. His hard work as an IDIA Trainee has paid off, with him gaining admission into Gujarat National Law University, Gandhinagar. Rishabh’s eagerness and capacity for learning new things is remarkable, and his IDIA trainers attest to his ability to excel as a lawyer. He was drawn to the study of the law because of a long-running curiosity about legislative processes in India, and how laws are interpreted and implemented here. Apart from studying, he enjoys drawing and sketching, and is a skilled portrait artist. Dharu, who hails from the village of Sointra in Jodhpur district, Rajasthan, completed his intermediate exams in 2015 with the Rajasthan State Board. His father, a humble farmer barely cobbles together INR 50,000/- each year, to support a family of seven! Being the oldest child in the family, Dharu has had to take on some of the responsibility of looking after his family on his already strained shoulders. But he transcended all of this through his academic excellence. After training with the IDIA Rajasthan Chapter for two years, Dharu cracked CLAT and secured admission to the Gujarat National Law University, Gandhinagar, one of the top ten law schools in the country. Dharu wishes to pursue a career in litigation, having been inspired by friends and relatives, so that he can bring justice to those who cannot afford it. Apart from being good in studies, Dharu is a gifted cricketer and is an avid reader. He has a great interest in reading biographies and mystery novels, and loves reading Nehru's works. Aritra Mondal, a dynamic and determined scholar who trained under the IDIA West Bengal Chapter, secured admission into Gujarat National Law University, Gandhinagar. Tragedy struck a few years ago, when Aritra lost his father while in Class XI. His father’s unfortunate demise threw his family into serious financial instability; neither his mother, who is a homemaker, nor his sister who was still in school could provide a source of income for the family. Aritra temporarily suspended his studies after Class XI, and realized after a year that a formal education- preferably in law- would better enable him to support his family. As luck would have it, his neighbor was an IDIA volunteer, and helped Aritra take the first step towards his goal of getting a legal education by introducing him to IDIA. Aritra’s motivation to excel in the legal profession is driven not just by his need to support his family, but also by his passion for justice. He enjoys playing the guitar in his spare time. Eshwar, a resident of Ameerpet, Hyderabad, belongs to a family for whom tragedy is no stranger. Around six years ago, his father was paralyzed, rendering him incapable of employment. His mother, the lone earning member of the family, works at a supermarket in Hyderabad. This did not dampen Eshwar’s spirits who, despite his visual impairment, burnt the midnight oil and secured his admission into Gujarat National Law University, Gandhinagar. Eshwar was meticulously trained by the IDIA Hyderabad Chapter over the last two years after having been selected from the Sai Junior School for the Visually Challenged in Hyderabad. Eshwar’s interest in law is augmented by his passion for argumentation and debate. He is an avid reader, and enjoys listening to music in his spare time. Ragvendra’s father is a taxi driver and the entire family sustains itself on about INR 60,000/- per year. At age 17, Ragvendra, a resident of Jodhpur, took on the staggering responsibility of running the household while his father was bedridden. His strength and initiative became apparent during this time, when he earned money by conducting tuition classes, alongside continuing his own schooling. Ragvendra has been passionate about studying law since he was in Class XI, and scored an impressive 144.25 in CLAT 2016, the highest CLAT score ever achieved by an IDIA Trainee in the general category! This performance gained him admission into National Law University Odisha, Cuttack. Sarath hails from the village of Panangad, in the Ernakulam district of Kerala. He completed his schooling from Kaloor Model Technical Higher Secondary School, Ernakulam. His hard work as an IDIA Trainee with the IDIA Kerala Chapter has paid off, with Sarath’s CLAT 2016 score securing him admission into the National University of Advanced Legal Studies, Kochi. Supportive of his interest in pursuing a legal education, Sarath’s parents enrolled him in the Heritage Coaching Centre in Kochi. Soon after his enrolment though, Sarath’s father, who works at a toddy shop and is the sole breadwinner of the family, started to find it difficult to support the costs of Sarath’s coaching, leave alone the possibility of the much higher costs of a good legal education. It was in these circumstances that Sarath was referred to IDIA by the Director of the Heritage Centre, and was selected as an IDIA Trainee. Sarath is drawn to the study of the law by his passion for debating, and his interest in subjects like political science and history. His confidence in himself and his capabilities has in turn inspired certainty in the IDIA Kerala Chapter volunteers that he will excel in a legal career. IDIA’s overarching goal is to facilitate the evolution of truly unique lawyers that make a significant difference to the world around them. Its aim is not merely to create technically skilled legal professionals, but leaders who transform society in significant ways: lawyers who are: Creative, Holistic, Altruistic, Maverick and Moral Problem Solvers (CHAMPS). The movement started off under the leadership of Professor Shamnad Basheer as a movement to eliminate the inequities of education. IDIA then geared up to question and change the statistics which portrayed a lack of diversity in the National Law Schools, with most students belonging to the upper middle socio economic class bracket. Taking things into their hands, it set up Local Chapters in different parts of the country. These local chapters conduct aptitude tests and initiate intensive training programme for those who did well, and those who are interested in pursuing law as a career. Once selected to the top law schools, IDIA arranges for sponsorships/scholarships and mentorship schemes to help candidates blossom to their full potential and take their rightful places as leading lawyers and community advocates. With approximately 70 IDIA scholars having made it to various law schools in the country since its inception in 2011, IDIA continues to be the fairy god mother for students who are eagerly waiting for someone to recognize their potential. The CHAMPS project was piloted last year, where IDIA scholars, along with IDIA volunteers, members of legal aid cells of law schools, and legal professionals visited the locale of one of IDIA’s scholars, identified specific problems faced by their communities and examined the extent to which law could help resolve some of those issues. For more information on the CHAMPS project please visit IDIA CHAMPS website page here.